A Shropshire solicitor has warned of the importance of making a will after seeing an increase in family disputes over inheritance. Emma Jacobs, who works for Shrewsbury-based Wace Morgan Solicitors, says that nationally such clashes have reached a record high. “There are a range of reasons for this hike in disagreements over inheritance,” said Emma, who is a technician member of Society of Trust and Estate Practitioners. “Mainly it is the complexity of modern families and rising property values which fuel claims. 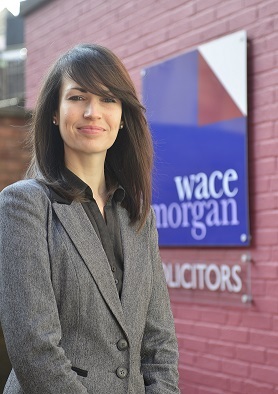 “Here at Wace Morgan we have seen a rise in the number of clients with more complicated family scenarios – second, third and fourth marriages, children from different relationships, unmarried couples, and estranged spouses and children. “Most people do not realise the implications of failing to adequately provide for certain family members in wills, or even worse, failing to make a will at all in these complex family scenarios. “Disputes over inheritances can be emotionally stressful and costly for all concerned. However, if clients seek professional advice regarding their wills, there are steps that we can take to reduce the risk of disputes arising and there are mechanisms that we can put in place to ensure that all parties’ interests are protected. National figures released recently showed that the number of High Court cases brought under the Inheritance (Provision for Family and Dependents) Act 1975 reached 116 in 2015, an 11.5 per cent increase on 2014, when there were 104 High Court claims. The number of claims has increased by a factor of eight since 2005, when just 15 cases were heard in the High Court.